Guaranteed to give up to 2 years surface protection. 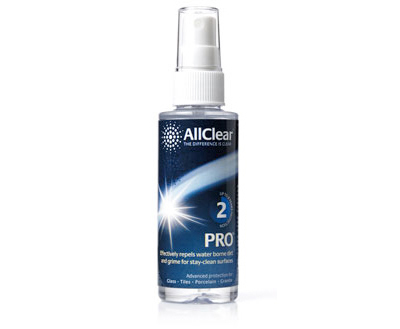 AllClear PRO is our mid range product and is a great way to cut cleaning effort and reduce the cost and environmental impact of using chemical cleaners in your home. Suitable for use on glass, tiles, porcelain and granite. Utilising the same advanced technology as our SWIFT coating, PRO is guaranteed to keep performing for up to 2 years. Coverage per bottle approximately 16m2. Bottle size is 120ml.